It was the wildest trading week in years, with net weekly gains ranging from 2.6% (Nasdaq comp'), 0.9% (sp'500), to 0.4% (NYSE comp', Trans). 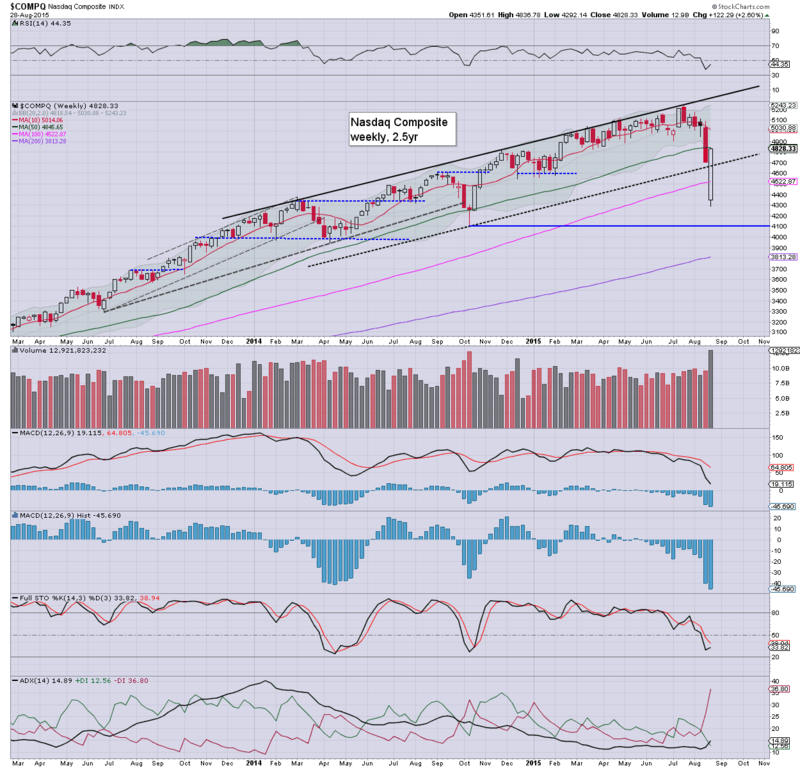 Near term outlook offers a brief retrace to the sp'1945/30 zone, before resuming higher into mid Sept' to the 2050/70 zone. A break under the recent double floor of 1867 is highly anticipated. The sp'500 opened Monday limit down... with an ES futures low of 1831... but with the actual index flooring at 9.35am @ 1867. After some truly wild swings, the sp'500 formed a secure double floor of 1867 at the Tuesday close, and then launched into a 126pt (6.3%) hyper ramp into Friday afternoon. 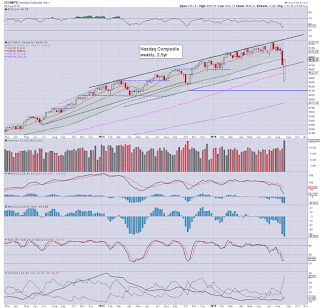 The closing weekly candle is suggestive of further upside into September. There are multiple aspects of resistance from the psy' level of 2000 to the 2050/70 zone. 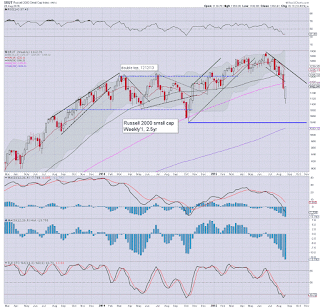 Sustained price action >2080 looks highly unlikely for some months. Indeed, a particularly bearish scenario is that the move to 1867 was merely a sub'1, wave'A (or however you want to name it), a bounce is now underway, with an equally severe down wave in late Sept'/Oct' to at least test the Oct'2014 low of 1820. For those who recognise the trend break of the giant wave from Oct'2011 (1074) to May 2015 (2134)... a realistic 38% fib' retrace would suggest the 1725/00 zone as viable. 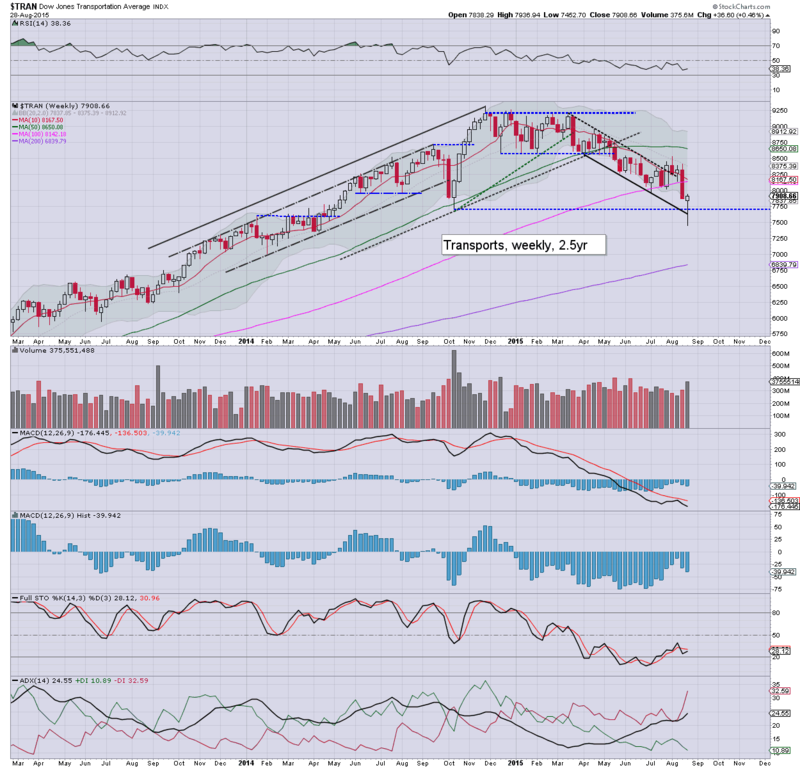 The tech' hit a low of 4292, before settling higher by a rather significant 2.6% @ 4828. 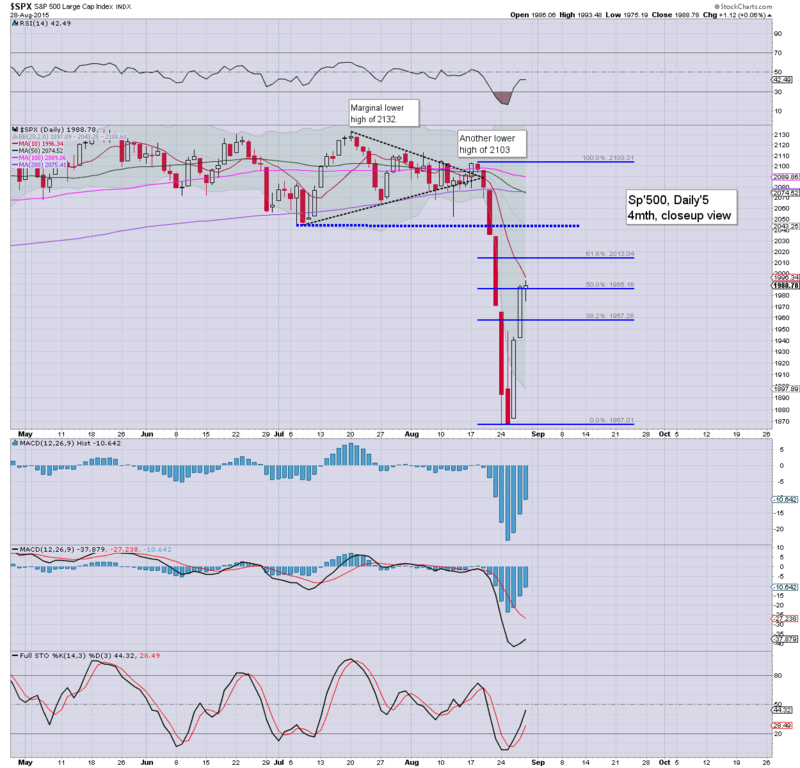 There will be VERY powerful resistance at the giant 5K threshold, which is around 4% higher... equating to sp'2040/50. 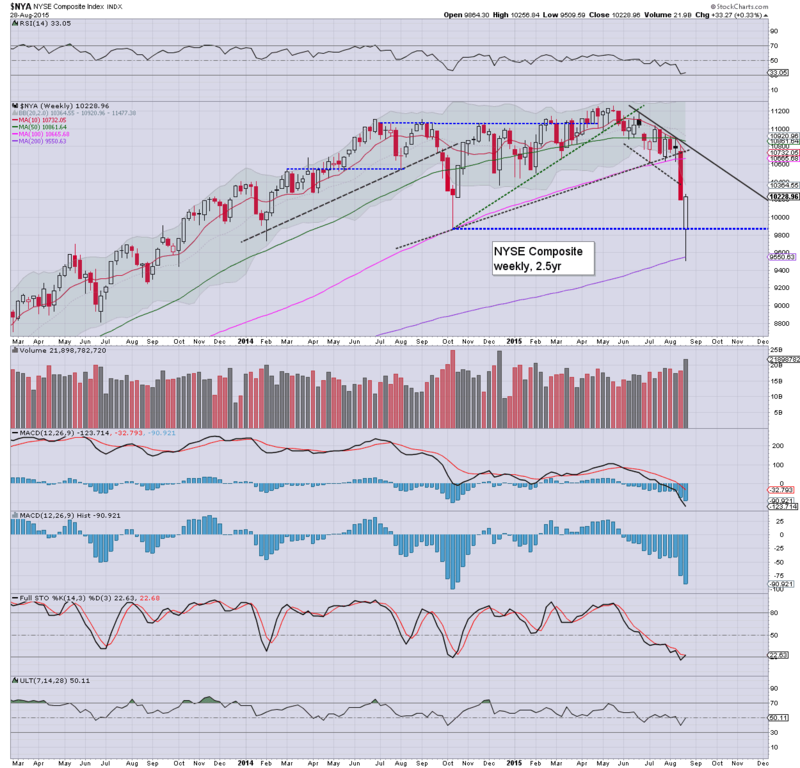 Renewed downside to the 4100/3900 zone looks possible in Oct'. The mighty Dow opened lower by over 1000pts at the Monday open, and saw some extreme swings across the week, settling +1.1% @ 16643. There is now powerful resistance (once key support) at 17k. Sustained action >17500 looks extremely unlikely. 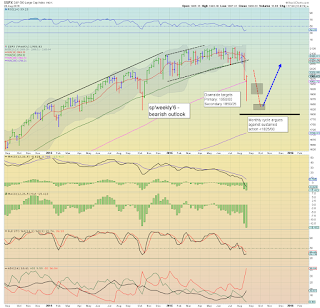 Broader downside to the 15000/14300 zone looks viable in Oct'. The master index managed to scrape a net weekly gain of 0.4%, having opened Monday at 9509, well below the Oct'2014 low (9886). 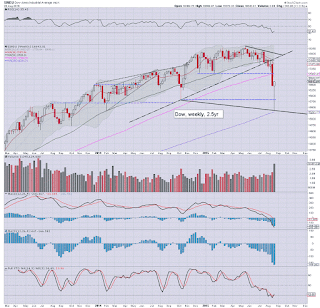 There will be core resistance around 10600, and renewed downside to 9200/9000 looks possible. The second market leader settled +0.5% @ 1162, having hit 1102. 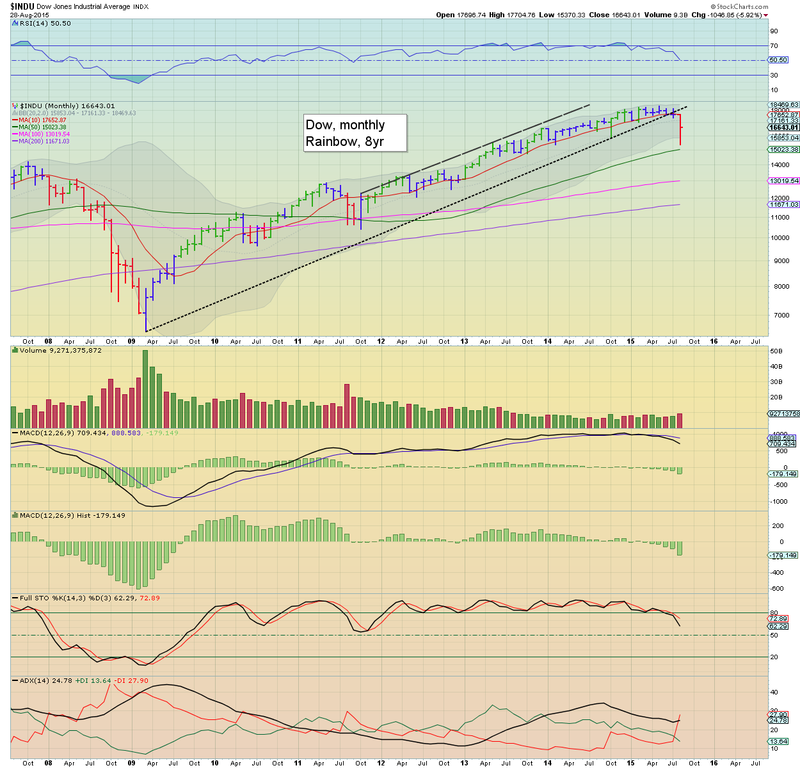 There will be strong resistance around the 1200 threshold in Sept'. 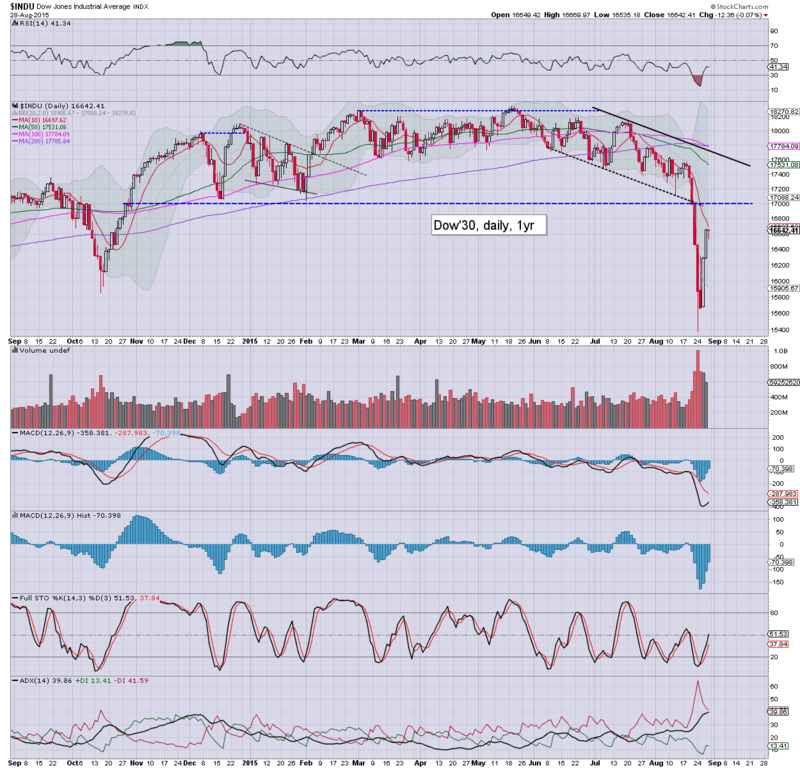 Renewed downside to test the Oct'2014 low of 1040 looks possible. 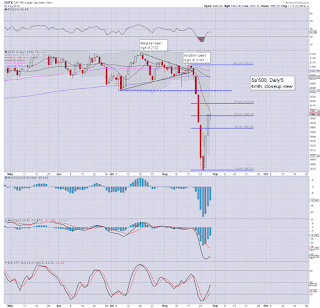 Sustained price action under the giant psy' level of 1000 looks unlikely in even the most bearish scenario. 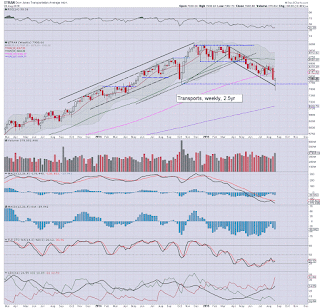 The 'old leader' broke a new multi-year low of 7452.. breaking the Oct' 2014 low (7700). 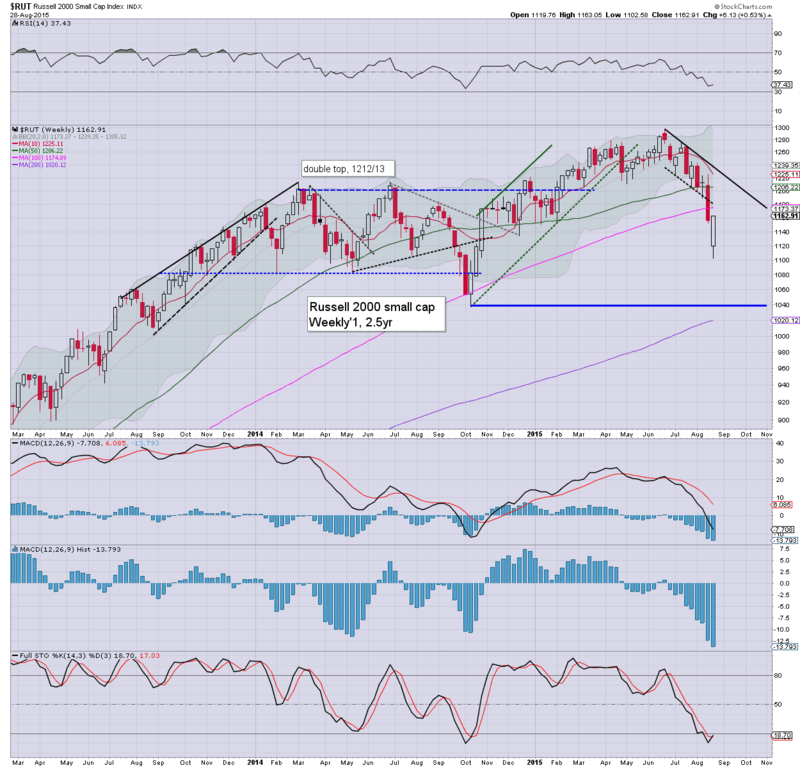 Near term outlook is bullish into mid Sept'.. with key resistance in the 8000/300 zone. 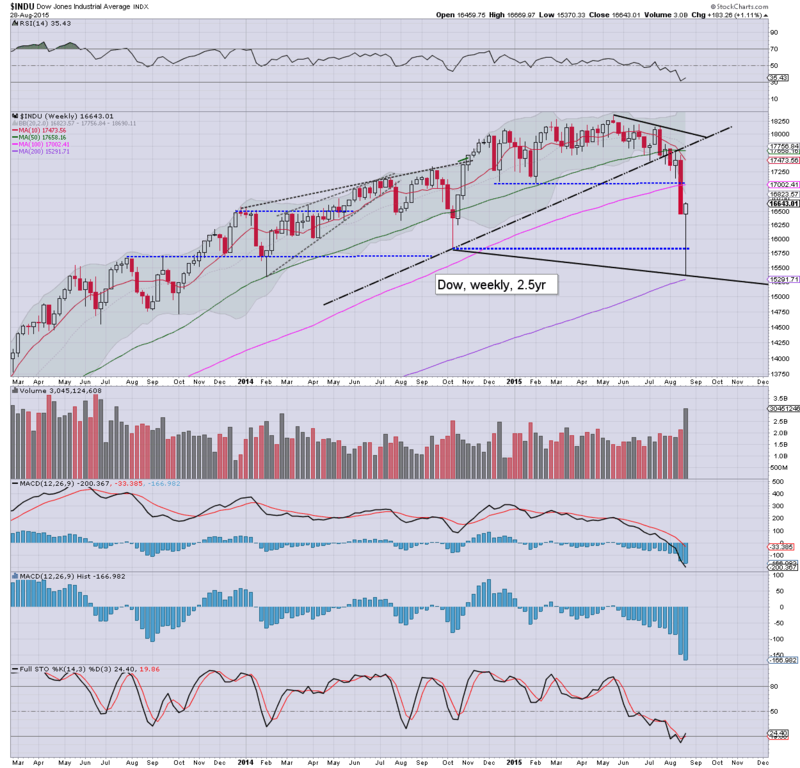 Renewed downside to the 7000 threshold looks highly probable in Oct'. Without question, it was a week of extreme and repeatedly wild swings. Equity bears gave the bull maniacs the biggest scare since the collapse wave of August 2011. 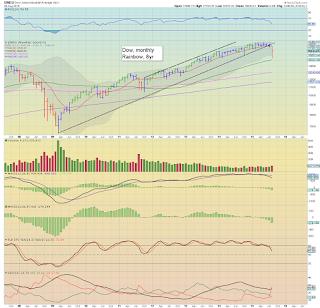 Despite all indexes managing net weekly gains, the technical damage done to the weekly and monthly cycles is rather monumental. 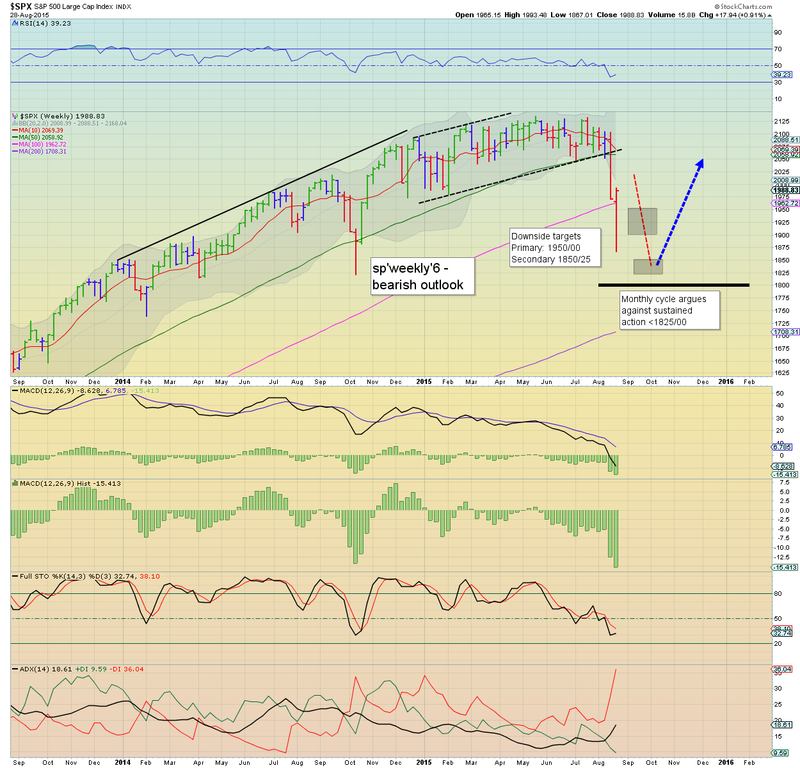 Frankly, sp'1867 makes little sense as a key low for the year, and I expect it to be undercut in late Sept/Oct'. 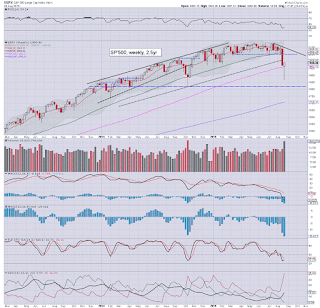 To me, the only issue is whether we'll see the low 1700s, before a late year rally into Christmas and early 2016. The coming week will largely center around the monthly jobs report, and what that might imply for the next FOMC (Sept'17th). *it is notable that Monday is end month.. so price action will likely be somewhat dynamic with higher vol'.. not least as many will be anticipating the next FOMC. It was unquestionably the wildest trading week since at least August 2011. With the sp'500 collapsing to 1867 (with VIX 53s), a successful re-test at the Tuesday close, and then seeing a hyper ramp of 126pts (6.3%) to 1993. The coming weeks.. and perhaps months, will offer more powerful swings. Suffice to add, it was an incredible week to be part of... and I expect more wild action in Sept/Oct... regardless of whether the Fed raise rates. In many ways.. they are arguably in a lose-lose scenario. 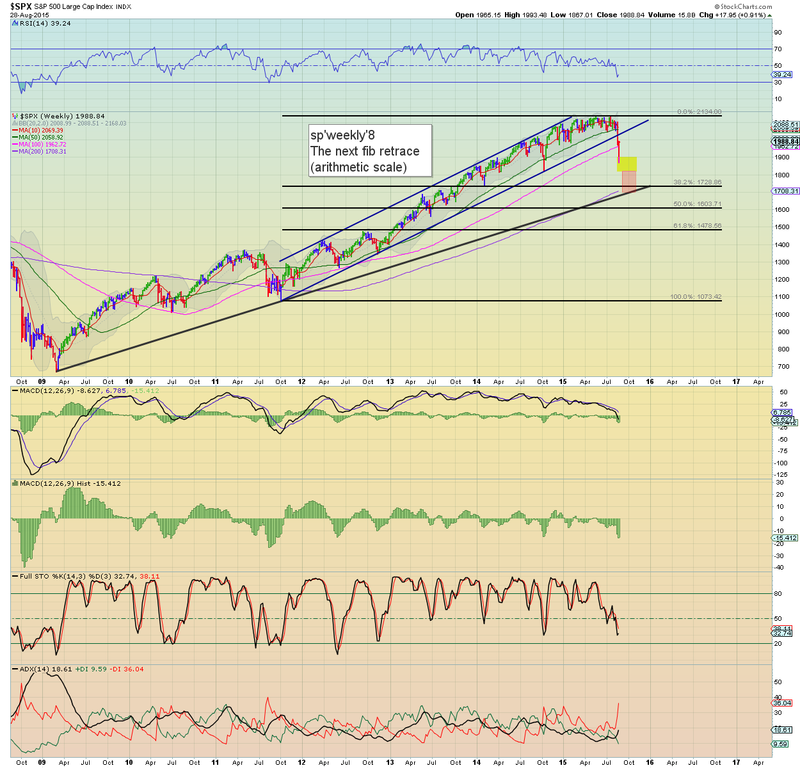 I remain open to a much deeper intermediate correction to the low 1700s. More than almost anything right now, the following chart should be a stark reminder to those believing we will just push straight up to new highs for the remainder of the year. 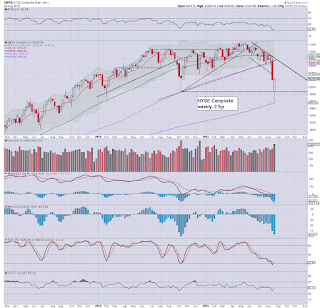 With one trading day left of the month the Dow is net lower by -1046pts (5.9%). I'm guessing Monday will be a net daily decline, so that closing month number sure ain't going to be pretty. 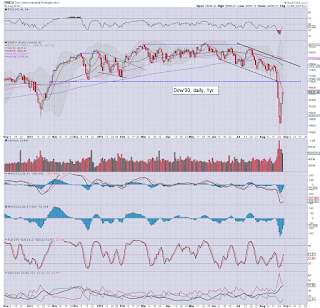 US equities closed moderately mixed, sp +1pt @ 1988 (intra high 1993). The two leaders - Trans/R2K, settled higher by 0.5% and 0.8% respectively. Near term outlook is for a retrace to the 1945/30 zone, before renewed upside to 2050/70 zone, into the week of the next FOMC (Sept'17). Suffice to note... a truly wild week in the US equity market, with the sp' having seen a clear double floor of 1867.. then a hyper ramp to 1993. A retrace appears underway to the 1945/30 zone by next Wed'. 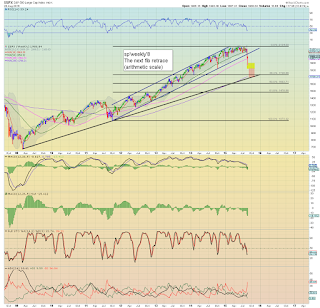 From there, upside into mid Sept'.. to 2050/70. 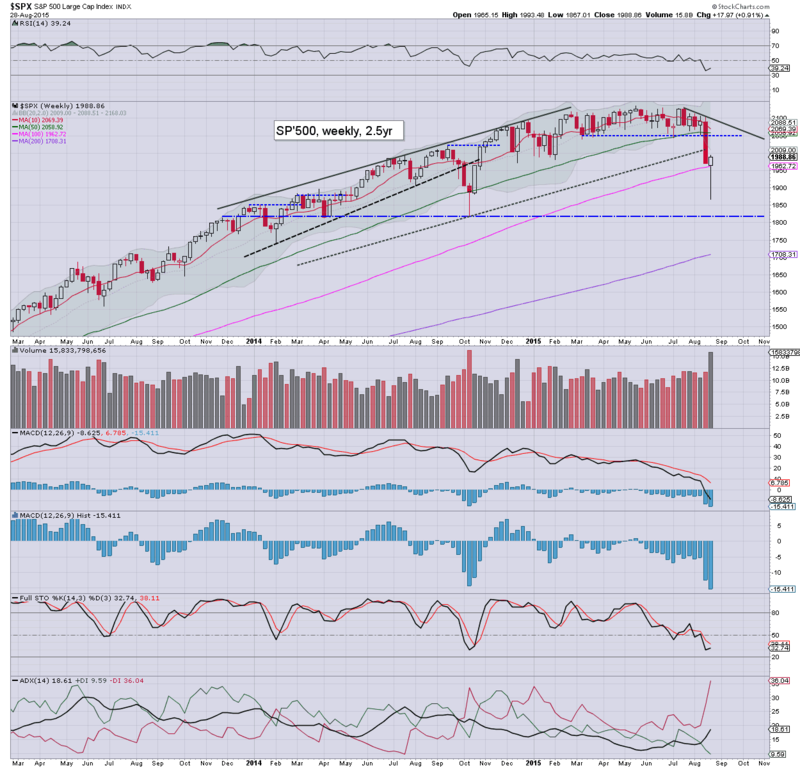 Broader downside into Oct'... the low 1700s remain a viable prospect in the next down wave.